Eliminate cross-diffusion of solvent vapors. Our solvent purification systems consistently deliver the driest solvent, so you can focus on what matters most, your research. We offer the best in safety, quality components for purification of organic solvents. Assisted by our dedicated team to determine which system is right for you. Our technical experts guide you step by step through the process of system selection. We offer solvent purification systems in a variety of designs to meet your needs. These systems have been designed so that they are easy to operate and incorporate all safety features. 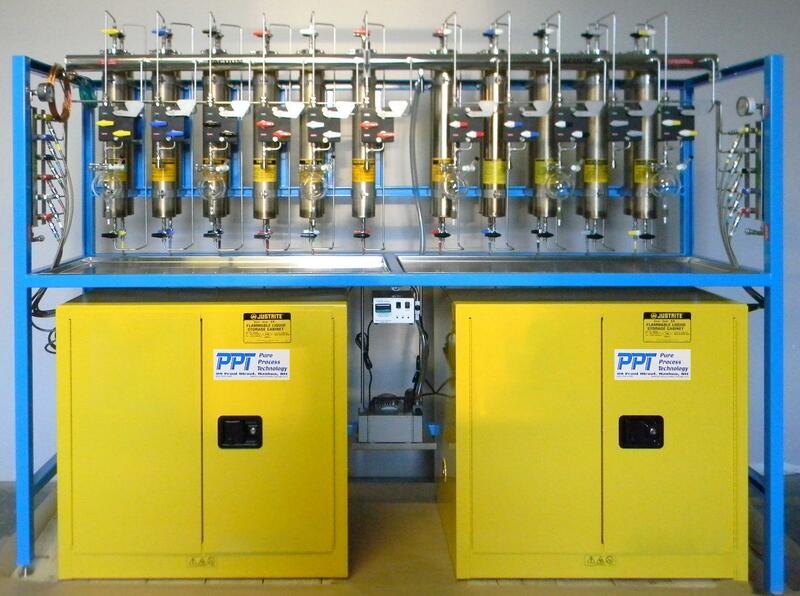 Our exceptional systems include everything you need to start drying solvents. Our Cabinet Mount Solvent Purification Systems are configured to fit existing spaces easily and effectively. Our Compact offering is perfect for those requiring only one or two Dry Solvents in the lab. This space saving and cost-effective design offers many of the features found in our standard Solvent Purification Systems. The standard in Solvent Purification, our freestanding SPS offers a flexible design with the ability to add future solvent columns when needed. When conditions dictate your Solvent Purification System be installed in a Fume Hood, we have your solution. Our innovative solvent purification ‘Enclosed Cabinet System’ replaces the need to put the solvent system into a fume hood, additionally, it is a safe and secure cabinet option that meets stringent EH & S department regulations. We offer a variety of products and accessories for all our solvent purification systems. Have multiple users requiring training or do not have the time or resources needed to get your system running? We offer an optional installation for all systems we manufacture. With this service, we will come into your Lab to set-up, commission and train all users on your new SPS. We will ensure your system is operating properly and train your group on all aspects of operation, review usage and make recommendations on how to maximize column lifetime. We highly recommend on-site training for Labs that are purchasing their first SPS. We can offer full customization based on our standard product offering. Our ability to customize our systems to meet your specific requirements is unmatched in the industry. PPT is the only company to call for challenging projects that require complex system integration or custom design services. Whether it’s during installation or with technical support PPT is always ready to help you understand our systems. Full training is provided with our Installation Services.